I went to a concert last Sunday. The concert titled “Nagasaki Port / People / City Music Festival 2018” took place being organized by Nagasaki Foreign Settlement Male Choir which I mentioned in this blog before with the cooperation of other local choirs, inviting Yomiuri Nippon Symphony Orchestra and some Soloist at Nagasaki Brick Hall. First, I was overwhelmed by the varied and abundant program. The program consists of three parts. 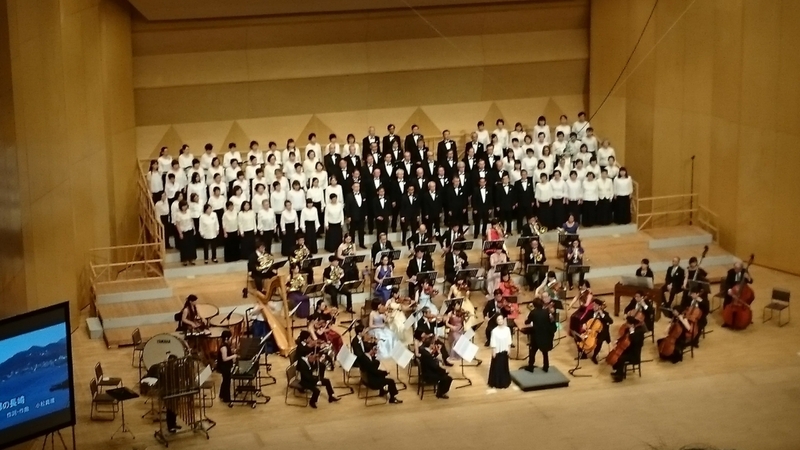 In the first part, Yomiuri Nippon Symphony Orchestra performed mainly playing an overture from an opera, a piano concerto, and some songs from “The Sound of Music” featuring a children’s choir. The pianist was a lady named Teratani Yoko who is active in Nagasaki. In the second part, five soloist sang songs from some operas in turn so I enjoyed each singer's fantastic voice. In the last part, choirs performed mainly so we could be absorbed in their powerful performance. A song which stayed in my mind most was ““Boukyou no Nagasaki (Nagasaki where is a place being cherished in some foreigner’s mind as if it were their own home town)”. This song which was composed by Komatsu Mari who is from Nagasaki was originally produced as an interval music for a documentary TV program aired on a local TV station. In this song, Hara Satomi who I mentioned in this blog before was the soloist and her singing reverberated through the hall. Actually, I don’t listen to classical music so much, but I really enjoyed this concert. I hope that this event could be regularly held every year as a unique event in Nagasaki.